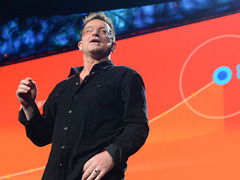 In today’s talk, Bono — U2 frontman, founder of the anti-poverty organization ONE, and 2005 TED Prize winner — reflects on the past decade’s dramatic reduction in extreme poverty worldwide. “Exit the rockstar, enter the evidence-based activist, the factivist,” he says. Bono: The good news on poverty (Yes, there's good news) Since 2000, according to Bono’s data, eight million more AIDS patients are getting antiretroviral drugs; eight countries in sub-Saharan Africa have cut their rates of death due to malaria by 75 percent, and the mortality rate for kids under five has fallen by 2.65 million per year—that’s 7,256 lives saved every day. According to Bono’s calculations, if this trend continues, 2028 will see zero percent of the population living in extreme poverty. Don’t miss this inspiring talk with a powerful message about the past 3,000 years of history. And for anyone interested in what it means to live in extreme poverty today, here is a series of nuanced essays and interviews that give insight. In February 2010, John Lee Anderson reported from post-earthquake Haiti in The New Yorker. The piece follows Nadia Francois, who was deported back to Haiti from the U.S.; through her story, we see a country not only ravaged by poverty, violence and political upheaval, but also “almost uniquely victimized by nature,” Anderson writes. Until recently, Mali “was widely viewed as a gentle if very poor democracy,” Joshua Hammer wrote in The New York Review of Books last month. “But the country has long combined poverty, radical Islam, and tendencies to armed rebellion.” In 2011, he writes, that “combustible mix” came to a head as northern Mali became a terrorist haven. In 2011, Philip Gourevitch wrote for The New Yorker about a cycling team in Rwanda through which boys like Gasore, an orphaned street kid, found second chances. In 2011, Barbara Ehrenreich wrote a decade-later follow-up to her book Nickel and Dimed, in which she went undercover as a minimum-wage employee to report on the extreme hardships Americans in poverty faced. It’s perfect for during a workout or two.